Why have we been members for 30 years? Two things come to mind. First, we have taken advantage of the programs and services that CalNonprofits offers, that help set a standard for us as employers. Second, both my predecessor and I strongly believe in the nonprofit sector having participation and a voice in civic affairs. I am busy working on behalf of some incredible people in long term care facilities – I even met someone who knew Mother Teresa! -- so I need someone else to keep track of the laws and regulations that impact my organization. CalNonprofits does a great job of lobbying on our behalf and keeping us informed. Our philosophy in community organizing and policy advocacy is to work in broad-based coalitions because, for example, successfully wheelchair blockading Governor Schwarzenegger’s office, isn’t the work of just one group. We appreciate that our membership with CalNonprofits connects us with an even broader coalition working for change. CalNonprofits has great customer service and they are always professional and helpful. Best of all, they advocate for us and get us the best insurance rates. I highly recommend joining the California Association of Nonprofits." 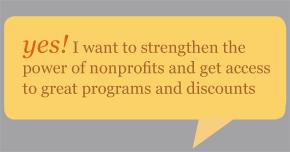 "We are always amazed at how much work and services are provided by CalNonprofits, despite having such a small staff. Further, we have saved HUNDREDS of dollars, by using your templates and materials for the employee handbooks. Our membership more than pays for itself, every year."